Even when the weather doesn’t cooperate, get your work done with a portable tool building. 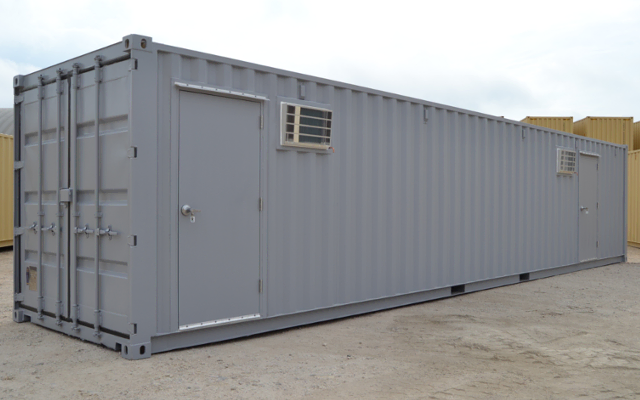 Onsite storage containers are effective protection for tools and materials that can double as workshops. With your choice of shelving, racks, cabinets, and benches, your equipment will be both secure and organized. 220V outlets for welding equipment. 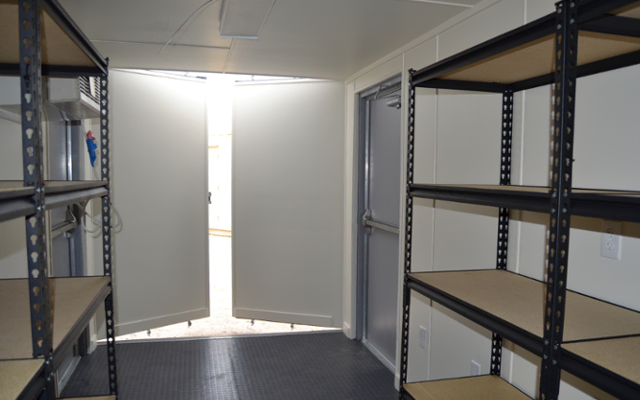 Secure personnel and overhead doors. Onsite Storage Containers Prevent Theft and Weather Damage. Theft and weather damage are two of the largest sources of material waste in the construction industry. Once you lock your tools behind the 16-gauge steel doors of your onsite storage container, it’s extremely unlikely anything or anyone will get to them. In addition to weather proof sealing, HVAC systems control humidity inside the shipping container. Your tools and materials are safe from rust, even when working in humid climates. Sheltering key pieces of machinery like welding equipment and small forklifts inside a conex tool building will keep jobs on track and give site managers peace of mind. Cabinets and Shelving Keep You Organized. 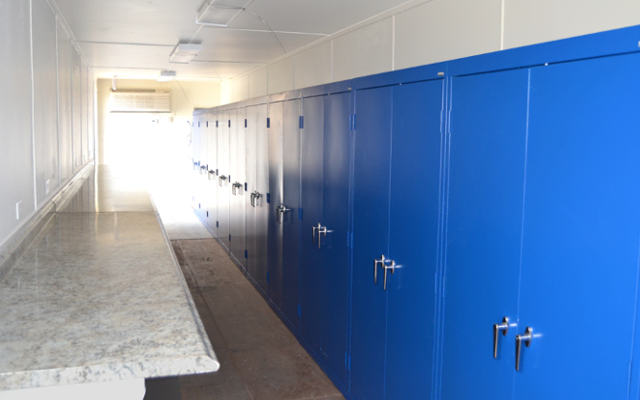 We’ll secure your choice of cabinets and shelving to the interior walls of the container. You can also turn part of the container into workshop space by opting for a work surface. Add overhead lighting, and your technicians will be able to keep working while they wait for the rain to clear up. Plug and Play Set Up Lets You Get Straight to Work. Don’t worry about adding wiring for HVAC systems, 220V outlets, and overhead lights; they come pre-installed in your conex tool building. Simply have an electrician connect your utility box to grid or generator power, and you’re ready to go. Site prep is easy, too. Because onsite storage containers have sealed undercarriages, you can place them in any flat, dry, and level location. Whether it’s a parking lot or patch or desert, you can deploy your container on rugged job sites. Looking for portable storage? We're happy to answer your questions. Contact us at 877-704-0177 or sales@falconstructures.com.